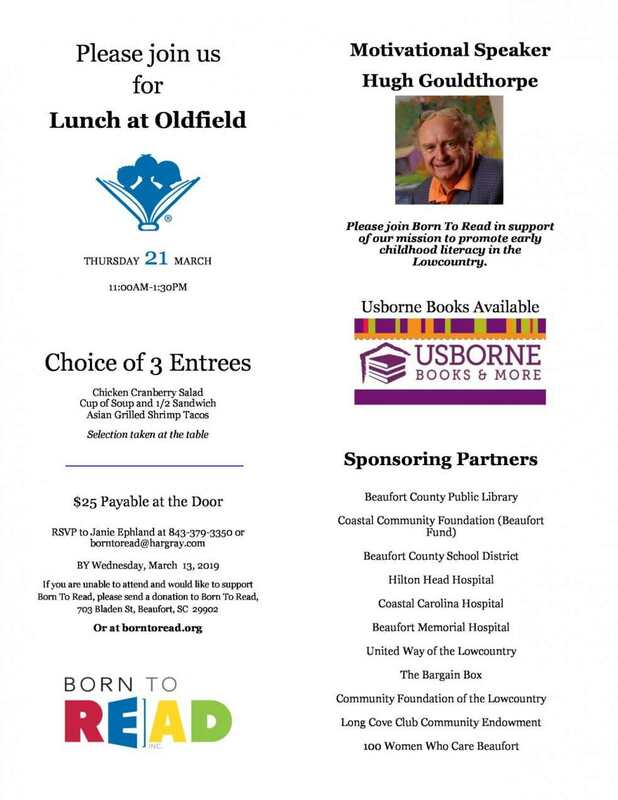 BEAUFORT, S.C. - March 7, 2019 - PRLog -- Born To Read, Inc. (BTR) is pleased to host a special luncheon to celebrate National Reading Month with the theme: For the Love of Books on Thursday, March 21, 2019 from 11:00am to 1:30pm at the Oldfield Club, Oldfield, 10 Oldfield Way, Okatie, SC 29909. The month of March is National Reading Month. This month is designated to motivate Americans of all ages to read every day. Reading regularly has been linked to development of positive mental health throughout our lives. Keynote speaker for this fundraising event will be motivational speaker and author, Hugh F. Gouldthorpe, Jr. Mr. Gouldthorpe will present a program titled: For the Love of Books. Area Organizations have been invited to sponsor a tablescape by creating a book-themed, decorative centerpiece. "With volunteers living in Beaufort, Bluffton and Hilton Head we couldn't think of a better central location to host this first-time event than at River Club, Oldfield," stated Janie Ephland, executive director. "We are delighted with the positive response and engagement from the local organizations in creating the tablescapes." She continued, "Born To Read is thrilled to have the highly-acclaimed Hugh F. Gouldthorpe, Jr. as our Keynote Speaker. His message will enlighten, encourage, and inspire." Tickets are $25.00 per person pre-paid or payable at the door and includes program and lunch. Seated is limited to 100. Contact the Born To Read Inc office by email borntoread@hargray.com or by phone at 843-379-3350 to register by Wednesday, March 13, 2019. If you are unable to attend and would like to support Born To Read Inc. please send your donation to Born To Read, Inc., 703 Bladen Street, Beaufort, SC 29902 or donate online (http://borntoread.org/index.php/make-a-dontation/). Sherri Shropshire, Independent Consultant with Usborne Books & More will have a book display. Usborne Books & More distributes books through thousands of independent consultants. Hugh F. "Goldie" Gouldthorpe, Jr. is a gifted motivational speaker, writer, and teacher in leadership, communication, marketing, sales, and organizational culture. He spent his entire business career sharing his thoughts and wisdom with education, civic, businesses, and government groups nationwide. : Born To Read, Inc.